For the past few years I’ve had the privilege of investing in leaders through the Young Staff Network. 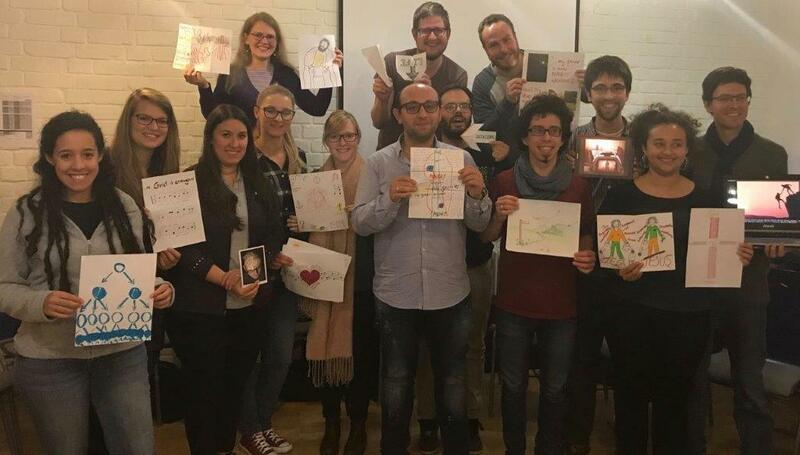 This is a network of new staff serving with IFES in Europe. Our aim is to be a community that enables staff to grow and lay good foundations at the beginning of their ministry. This time last year I was challenged to think about what it might mean for this learning community to be a listening community — a community that is being transformed by the Word. This touched on a feeling I already had: we spend a lot of our time teaching the Word to others, but I wasn’t so sure whether our own personal engagement with the Word had the same high priority. So we set a challenge for our young staff. We asked them to soak in Peter’s story over a period of 6 months. This involved reading Mark, Acts and 1 Peter as well as completing some exercises both individually and together with others. We wanted them to look at how God formed Peter as a leader, and through that to reflect on how God is forming them. At the end of this challenge we met together to reflect and share about the experience. This meeting was both discouraging and encouraging. It was discouraging because it confirmed that personally engaging with God’s Word is not very high on our agenda. There were exceptions, but most of the staff had struggled to make time for this. They were so busy doing that taking time to soak in God’s Word seemed like a luxury they couldn’t afford. I don’t think they are unique in this struggle. There is the temptation for all of us to focus on what we do, on the aspects of our ministry which others see. Then we start to neglect our need to have our own hearts and minds constantly renewed and transformed by God’s Word. This is an incredibly dangerous place to be in. But this experience also showed me something else: when we do give time to listen to the Word together in community, God speaks and his Word transforms. As we reflected together on what we had learned, there was one common theme: God is patient in how he develops leaders. As we reflected on Peter’s failure, we saw again: it is not our competency that enables God to use us, but rather it is his grace. Just like Peter, we are prone to failure – as our lack of engagement with God’s Word shows. But God is just as patient with us; he is just as willing to offer us grace. God longs to speak to us, so let’s keep listening. Heledd is from Wales, living in Italy. She is part of the IFES Europe Leadership Development team,primarily responsible for co-ordinating the Young Staff Network. Standing at attention. Pause. Stop and listen. Underlining what has just been spoken. In the psalms, “selah” is a break between different parts of the psalm. While its meaning is unclear, it could come from the Hebrew root “salah” which means “to hang” or “to weigh”. In the context of our hearing of the Word, it means the space we allow for the Word to study us! We use selah to mean 10-15 minutes of standing in God’s presence, embracing his Word, and allowing his Word to scrutinize our living. Every time we have East Asia student conferences, we intentionally begin our day with selah. We remember the key phrases spoken (either in silence or as a spiritual director holds up these phrases). With these phrases in mind, we linger in God’s presence – creating space for God to impress his Word upon us and for us to weigh our response to him. Sometimes, a soul-searching question is added to this time of selah. Amazing how silence and solitude begin to do their work! It is moving to see how the Holy Spirit stirs our hearts with the Word just heard and calls forth a response. The students find that this pause calls their attention to what God is doing in their lives – something which easily gets lost in the busyness of their daily lives. Over the years, this practice has caught on across the region. 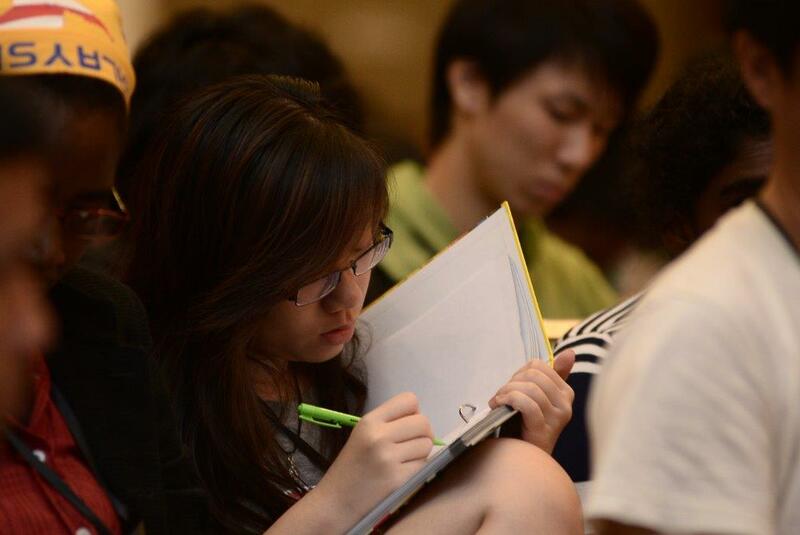 At the student leaders’ retreat in Singapore (2014), God used this time of selah to break into their hearts. It was a time of being convicted together and listening to what God really wanted to do through their fellowship. In a campus group in Malaysia, the prayer coordinator starts the weekly prayer meeting with selah. She invites students to weigh what God has been speaking into their lives throughout the week – giving time for individuals to be searched by God and his Word. This has made many students much more intentional in their living. Many campus fellowships end their time of Scripture Engagement with a few minutes of solitude for God’s word to be embraced. These are some of the subsequent ripples which can be seen across our movements in East Asia: “The Word and its demand became clearer to me“; “God’s Word convicted me“; “I gave up to God the things I was holding back“; “I felt comforted and released from the burden of guilt and shame I had hung onto“; “I kept the commitment made five years ago in selah and am now changing jobs because that is where God is leading me“. Come, let the Word study us! He, who has an ear, let him hear! Reading Bible passages out loud is one way of actually hearing what we are reading. ‘Speaking Scripture’ takes this into an account. It is an excellent way of entering into a passage, for example in small group Bible studies. Instead of the Bible passage being read aloud once, it is spoken repeatedly. Students learn to listen carefully. As they listen and imagine the context of the first hearers, they begin to speak the words in a way which is so much more alive and meaningful. When using this approach in a small group Bible study, the facilitator gets different students to ‘speak Scripture.’ As one student speaks a portion of scripture, invite those listening to respond: ‘How was the speaking? Can you feel anything? Did it make you think further?’ Then ask other students to try speaking it. Some background information can help the students imagine the situation. The facilitator can ask the students to identify with what is happening by putting themselves in the shoes of the people involved: this includes all the characters of a narrative, but also, for example the psalmist, the prophet, or the writer of a letter. The facilitator can ask questions along the way, like: How do you think Jesus says this to the invalid? In what tone does the invalid respond? (John 5). How would Paul have said what he writes in the letter to Philemon? How does the psalmist utter his thanksgiving to God? ‘Speaking Scripture’ has proved to really help students enter into the passage. In the initial stage, students may find it a bit awkward, and they may laugh as they speak. But when they put themselves into the passage, the Word comes alive to them, touches their own lives, and changes their approach to understanding God’s Word. To be a little bit more creative, acting can also be added in as the students speak scripture. However, the facilitator needs to see whether this will distract or help, as it can sometimes be a hindrance. You can begin by trying out passages from the gospel narratives. You can then try out epistles, psalms, prophecy. In fact, all genres found in the Bible can be approached in this way. ‘Speaking Scripture’ has changed me and the way I facilitate Bible studies with students. May you also discover the great value of this approach! Come and be participants by speaking Scripture, speaking and entering into the Word that transforms lives. Have you ever been in a conversation and suddenly realized that you completely missed what the other person just said? Have you ever read through a Bible passage without taking in the content? I have. For many of us listening is a challenge. Our thoughts are full with so many things: we are pre-occupied. And then we are unable to take in anything new. In order to survive our studies, many of us learnt to speed-read. We read quickly in order to be effective, but when we bring this to Scripture, it is not at all effective. Unless we slow down, we will not listen well. How can we learn to stop and listen in the midst of our busy lives? How can we create space to receive the Word of God? The answer to these questions does not only have to do with how we read our Bible, but also with how we live our lives as a whole. Over the past years I developed the habit of staying up very late at night. I knew it wasn’t a healthy habit, but I wasn’t too concerned. Eventually, however, I realized that it was affecting me in negative ways. I had a hard time waking up in the mornings. I often felt tired during the day and was always in a rush. This prevented me from having quality time with God and his word. I felt tired, but also restless, desperate for God’s presence and guidance. The Lord made it clear to me that I needed to make a practical change in my lifestyle: go to bed earlier. For the sake of my health, but also for the sake of my soul! Now, I am in the process of changing my old habit. Some days I really struggle, but by God’s grace, progress has come. This simple change in lifestyle means that I get better rest, wake up earlier, and start the day with God. Since starting to read the Bible in the mornings, I have a new relationship with God’s Word. I am enjoying God from the beginning of the day. And that changes everything. Listening well is also related to our lifestyle in another way. It includes obedience – responding to what we hear with our words and deeds. Jesus said: “My mother and brother are those who hear God’s word and put it into practice” (Luke 8:21). Scripture engagement is key to the ministry and mission of IFES. This website provides stories, reflections and resources from around the world on what it means to love, study, live and share God’s Word. Be the first to receive updates to this blog by signing up for the quarterly newsletter.